Here's the deal. I did tons of hard work on this bathroom many-moons ago. I took it from 1980's to 2010-ish by painting about every surface in sight. It looked so much better; many of you thought it looked great. BUT, since I live with this bathroom every single day, a few things started to bother me. And since this is a blog about the mundane happenings of my house, here's THAT story. I came home with 3 amazing scores. 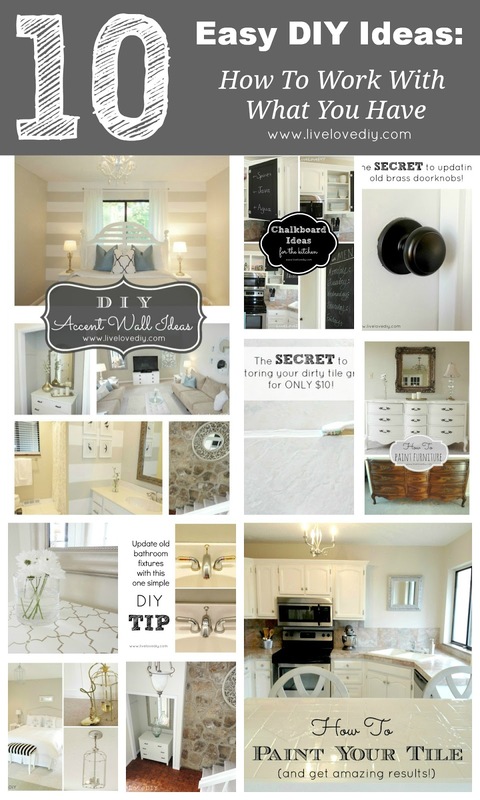 I found this amazing chandelier that I rehabbed, and then I found 2 very awesome things that set me off on a bathroom-mini-makeover. 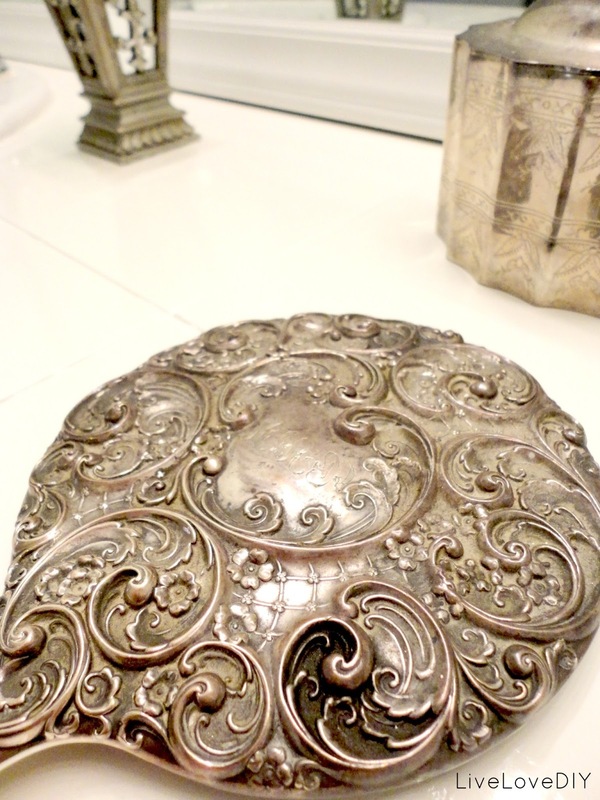 So, my absolute favorite find was this antique hand mirror. My grandmother gave me one almost exactly like it several years ago. It resides on my dresser, and I adore it. So, when I saw this one at the thrift store for $11, I yanked it up in warp-speed. There's so much total junk at thrift stores, but I always keep going back because there are treasures to be found, peoples! The next thing I found I knew I wanted the minute I spotted it, but I had no idea what I would do with it. It was a silver framed mirror for $6. I thought it was really pretty, and for $6 you really can't miss. And then I picked it up and put it in my cart and saw a pottery barn pricetag on it. For $89. Now, I'm sure this thing was probably from 1998. But, still. You can surely imagine my brain celebration. And when I brought it home and thought about it for a wee second, I knew. It would go where the 'crappy bath art' used to go. And now here is the thrifty PB mirror ! It basically took my bathroom from 6-year-old-bath-time to normal zone. Sometimes you just don't get it right on the first try. You may also notice that I got some fancy new soft plush gray bath towels. I have a bad habit of using my towels as drop-cloths when I paint, and it was a necessary upgrade. And since I grew to hate that awful youthy-loud-flowery shower curtain, I replaced it with a calm, cool, and collected adult version. 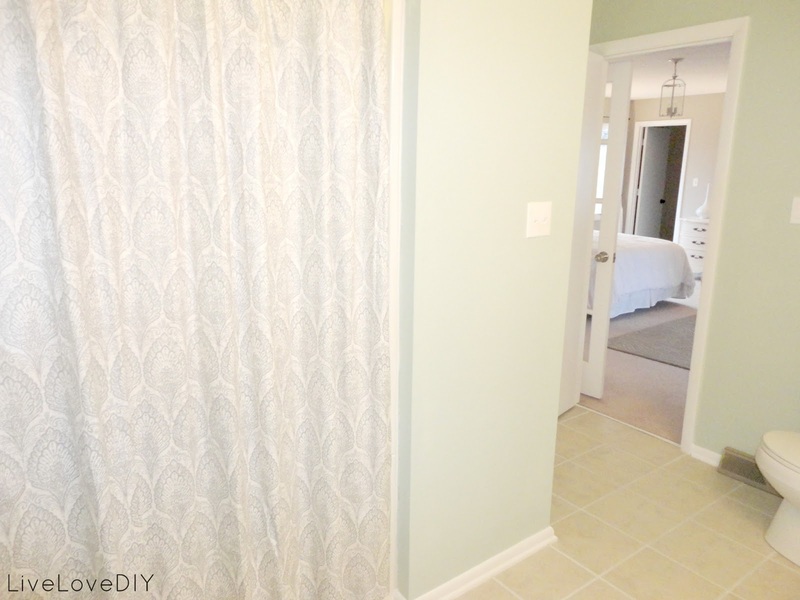 Welcome Mr. gray, damask, pretty! And I love how a few fancy accents can totally take a vanity from plain-jane to luxurious! In case you missed the first bathroom-redo post, that small canister and soap holder were also thrift store finds. The canister was real silver, too. Not that I care...I would sport a paper plate soap holder if the price was right, but hey, extra bonus points on a worthy thrift store find! So, now, for those of you who missed the transformation of this bathroom on the first go-round, let's reminisce. Check out how gnarly this bathroom used to be before I got my paint-obsessed-little-hands on it! And now, of course, it's latest updo without those awful letters! Again, if I was 6, my name was Jacob, and I liked to take a bath, the BATH would be appropriate. But, I'm 29, people call me Virginia, and there isn't even a bathtub in this bathroom, so let's keep it real. The toddler letters had to GO. Oh, and one more teensy bit of reminiscing. If you're looking for a way to refresh your GROSS tile grout (I'm no stranger to disgusting grout), I found a pretty good solution, and I totally restored my tile grout. You can find all the gritty details here. Here's a little grout-restoring-proof for ya! Thanks for listening to me ramble, and for caring about all of the ridiculously mundane details of my bathroom! Check out our house tour here! check out some of our fave posts here! Is there anything better than finding a thrift store item with a price tag still on it? No...the correct answer is no. Lord knows I've decorated plenty of things that I look back on and wonder what I was thinking! I'm always torn between taking the time to fix them or leaving well enough alone and moving on to a new space. Your bathroom looks great and adulty - though I did really like your previous shower curtain. 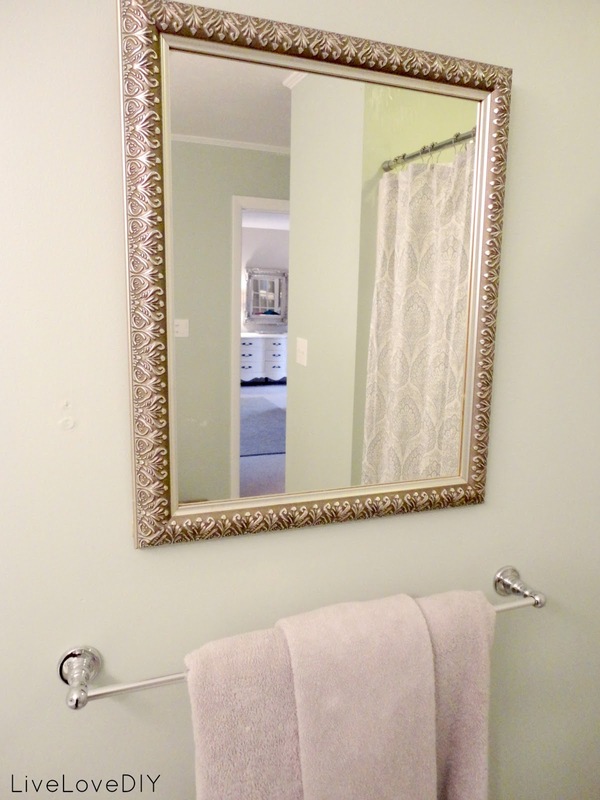 And I'm thinking I need a fancy silver hand mirror so I can look into it a feel like a a pajama wearing, unshowered, toddler wrangling version of a disney princess. lol - You crack me up. Your bathroom looks very serene. Love the new mirror. Your comment about the BATH word art being for 6 year olds, made me laugh. I put the BATH word in my sons bathroom and I am slowly adding the final touches. Your bathroom is a well- deserved fabulous! White paint is so underrated! 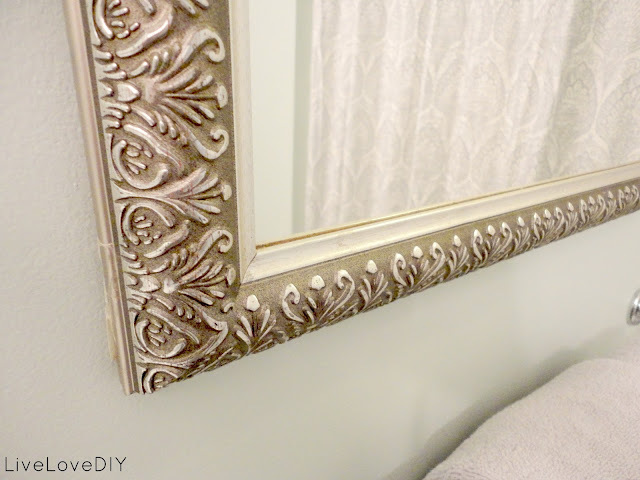 Love the transformation, especially the mirror. Thanks love! It is definitely underrated! You're a sweetie! It looks wonderful. I always enjoying reading your blog. LOVE your humour! The bathroom looks great! your obese-poorly-behaved-cat...oh my :) Seriously though -- I would have been FIGHTING you for that mirror. Does your husband know silver gets you going? 'Cause he should be frequenting the thrift store too, you know? I actually LOOOOVE the "loud mouth flowers" shower curtain! Where did you find it? Your whole home is beautiful! The color palet makes it calm and peacful looking! Why do you always do this to me? Why? Now I have to go out treasure hunting today! ha!! Court, I wish you lived here so we could go together!!! I need a thrifty buddy to go shopping with!!! 'Spose you could have put up KITCHEN and really confused someone! Hee hee! Love the latest bathroom look! You just keep getting it better and better! 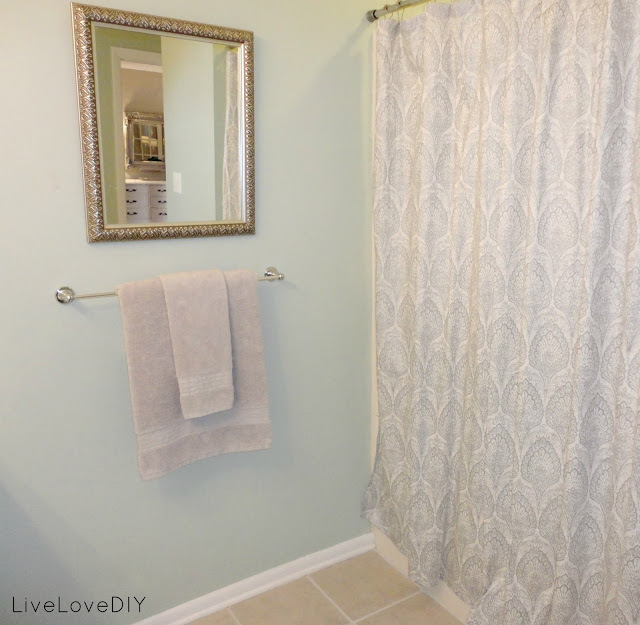 I love that loud shower curtain but I admit, I was surprised to see it in YOUR bathroom! 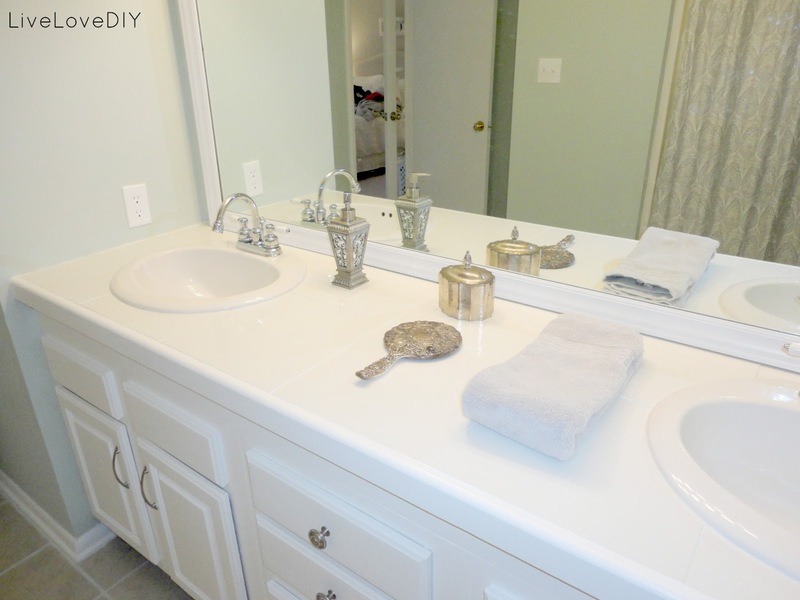 :) Reguardless, the bathroom looked great both ways, the finish is elegant and fitting for your style. And I totally get you on the connecting thing in writing, I am trying to learn that too. ♥ xo. p.s. I forgot to also say, what an amazing (score!) 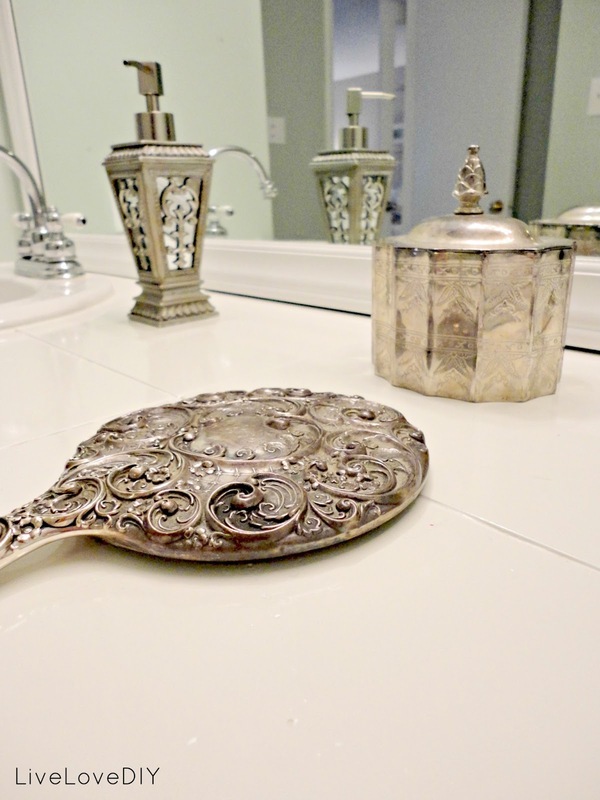 find with that silver mirror, it's beautiful, and it's so true about treasures in thrift shops, you just gotta look... never know what you might find! Love how the mirror made such a dynamic change-I also enjoyed seeing the beginning of the bathroom transformation! I must say you do good work!! Beautiful transformation! You are so very talented and I am truly inspired when I visit your blog. 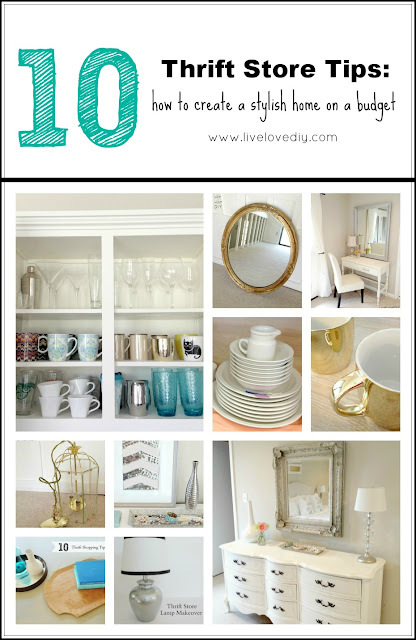 I especially love your post on painting trim (I, too, have the ugly orange wood trim) and on thrift shopping. 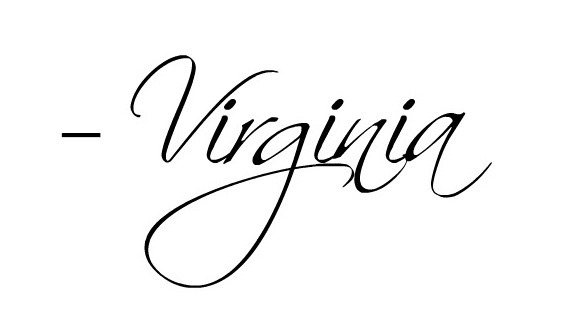 Hi Virginia, I enjoyed reading your blog article. 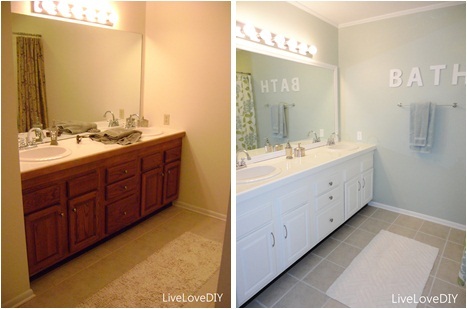 I love what you did with the bathroom and how you transformed it. I like how you kept it simple and at the same time very stylish. That silver mirror is beautiful; it adds sophistication to the entire room. How is the grout renew holding up after 6 months? Hi! What is the paint color you used? 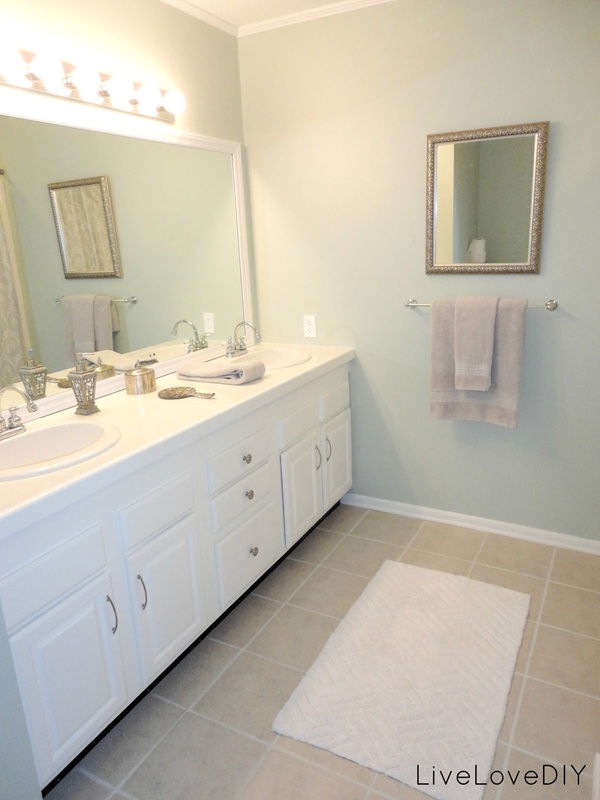 I am looking into updates for our master bathroom and I love the look of this paint! Thanks!